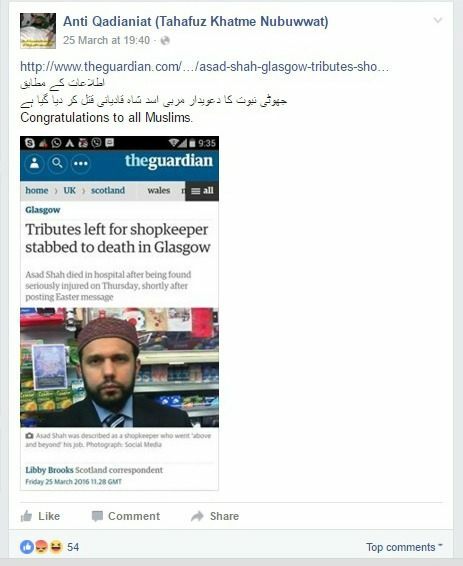 The horrific murder of Asad Shah, a peaceful Ahmadi Muslim shopkeeper living in Glasgow, has been celebrated online by Muslims who believe his brand of Islam is “false” and “heretical”. Previous online postings by the group have also emerged attacking Mr Shah and his brand of Islam, while his family have been advised to go into hiding. 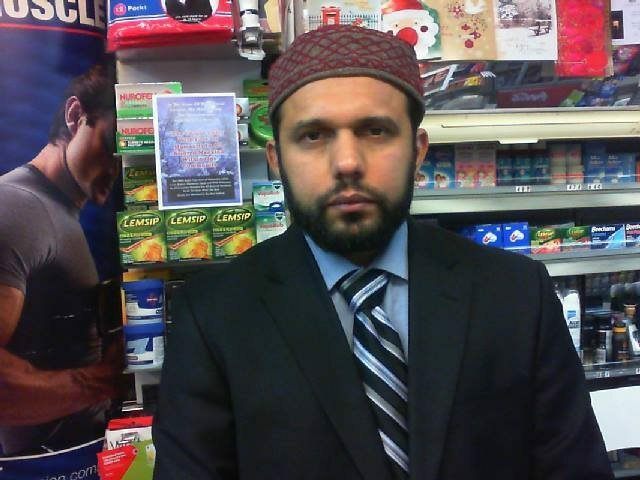 Asad Shah, who regularly posted videos and messages of goodwill to the internet, was stabbed repeatedly in the head outside his shop last Thursday just hours after wishing Christians a happy Easter on Facebook. One witness has said his killer also stamped on him during the frenzied attack. The murder shocked the community and a flood of tributes has been pouring in for a man described as “warm and friendly”. A GoFundMe page set up for his family has already raised more than £100,000. It has now emerged that the group has a history of animus against Mr Shah for his peaceful views, posting clips of Mr Shah’s peaceful preaching onto the video-hosting site DailyMotion and labelling him a “false prophet”. Ahmadi Muslims are considered a heretical cult by other Muslim sects as they recognise later prophets than Mohammed, and reject jihad. Consequently, Ahmadiyya are among the most persecuted of Islamic sects; violence against them is rife in Pakistan and elsewhere within the Islamic world. Mr Shah’s murder appears to fall within this pattern; police are treating the crime as “religiously motiviated”, and have confirmed that the two suspects arrested are Muslims. A source told Scotland’s DailyRecord: “The police are ­looking at claims that this man has taken offence to religious posts that Asad made. “The theory is that he saw what Asad was saying on Youtube and Facebook and drove up to track him down. The hardline Sunni Muslims call Ahmadiyya Muslims kafir. They say they are non-believers. “It’s not unusual in other countries to see them killed just for their beliefs, it’s been going on for years. “But if this is what has happened here in Scotland, it’s worrying. It is not clear whether the two men arrested are associated with Khatme Nubuwwat, but a petition has been launched calling on Home Secretary Theresa May to investigate the group on the basis of its support for his murder. The petition reads: “Khatme Nabuwat’s sole purpose is the annihilation of the Ahmadiyya Community, who they refer to with derogatory language as ‘Qadiyani cult’. Their website features fabrications about the community and their preachers say that Ahmadis are ‘Wajib ul Qatl’ – worthy of death. The Facebook post celebrating Mr Shah’s death has attracted some derision by Facebook users. In a statement released via the police, Mr Shah’s family have said: “On Thursday evening a beloved husband, son, brother and everyone’s friend, Asad Shah, was taken away from us by an incomprehensible act. We are devastated by this loss. “A person’s religion, ethnicity, race, gender or socioeconomic background never mattered to Asad. “He met everyone with the utmost kindness and respect because those are just some of the many common threads that exist across every faith in our world.